June 1, 2012 - The Department of Transportation’s Office of Inspector General (OIG) Principal Assistant Inspector General for Auditing and Evaluation testified before the House Aviation Subcommittee on the Federal Aviation Administration’s (FAA) efforts to consolidate air traffic facilities. This was at the request of the Subcommittee. OIG initiated an audit to review the FAA’s plan for large scale realignments and consolidations of its air traffic facility network, key challenges that FAA faces in executing its plan, and actions the Agency can take in the near term to successfully consolidate its facilities. According to the FAA, the average age for an en route center is 49 years, while the average age of a TRACON is 28 years. In 2008, OIG reported that 59 percent of FAA facilities were over 30 years old and identified structural deficiencies and maintenance-related issues at many facilities. Sustaining the existing air traffic control system would require the Agency to spend a significant portion of its capital budget to replace and maintain these aging facilities and related infrastructure. 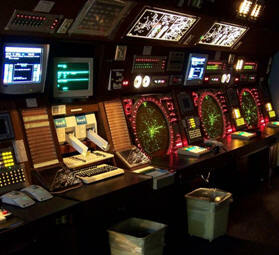 In fiscal year 2012, the FAA plans to spend $104 million to replace or improve TRACONs and air traffic control towers, $47 million to maintain en route centers, and $78 million to sustain electrical power systems. The FAA reported in 2010 that 83 percent of its facilities were in either poor or fair condition and that the infrastructure at some facilities would not support NextGen and other modernization initiatives. Many of the Nation’s air traffic facilities have outlived their useful lives and cannot take advantage of newer technologies. FAA formalized a plan last year to begin consolidating them into larger, integrated facilities over the next 2 decades, beginning with facilities managing airspace in the Northeast. However, FAA is early in its planning and has delayed making a final decision until next May on where to build the first facility. Regardless, the FAA will still need to align consolidation plans with ongoing construction projects, make technical decisions that could significantly alter the cost and schedules for other modernization programs, finalize project cost estimates, and address associated workforce issues. Northeast Integrated Control and High-Ops Facility - TRACONs within the Boston Center’s airspace - Airspace at or below 30,000 feet from the Boston Center. - The facility will be co-located with operations from the New York and Boston Centers that control airspace at or above 31,000 feet, along with oceanic operations. Great Lakes Integrated Control and High-Ops Facility - TRACONs within the Cleveland Center’s airspace, including the Pittsburgh, Cleveland, and Detroit TRACONs - Airspace at or below 30,000 feet from the Cleveland Center. - The facility will be co-located with operations from the Chicago and Cleveland Centers that control airspace at or above 31,000 feet. The FAA’s Decisions Regarding the First Site Have Been Delayed. The FAA has pushed its decision to approve construction for the first facility from November 2012 to May 2013. This is primarily due to delays in selecting a site for the facility and tight funding limits called for in its recently passed reauthorization. The FAA officials noted that the delay will affect the FAA’s schedule for consolidating other locations within the first segment, though the impact has not yet been determined. The FAA’s decision involves determining complex operational, logistical, and workforce aspects of the consolidation, including the facility’s airspace boundaries and total operating positions, the size of the building, the total number of controllers, technicians, and other employees working at the facility, the automation and other equipment to be installed, transition schedules for existing facilities to move to the new building and workforce-related issues. Technical decisions for the first integrated facility will impact the current modernization plan. The FAA modernization plans are based on the current facility set-up for en route centers and TRACONs not consolidated or integrated facilities. According to FAA, the Agency is in the early stages of defining the technical requirements for an integrated facility and making decisions about major acquisitions. These decisions will impact the Agency’s future modernization plans and budgets, including NextGen. For example, the En Route Automation Modernization (ERAM) program is currently being deployed to 20 en route centers, including locations in the Northeast where the first integrated facilities could be built. However, FAA has not made changes in its Capital Investment Plan, and the full extent of the changes will not be known until FAA solidifies its plans for the integrated facilities. National Air Traffic Controllers Association President Paul Rinaldi reaffirmed the organization’s commitment to a collaborative relationship with the FAA and modernization of the National Airspace System (NAS) during testimony before the House Transportation and Infrastructure Subcommittee. While Rinaldi emphasized the collaborative relationship, he stressed to the Subcommittee that facility realignments must be part of a comprehensive plan and must be accomplished with inclusion of the agency’s frontline workforce and without compromising safety and efficiency, reducing services or increasing the cost of the NAS.